We have had an exceptional week! We have a golden new investigator! Her name is G … , and she is super interested! She really likes to talk, but we are going to set a baptismal date with her. V … is so close! She read Alma 32, and just can’t stop thinking about it! She will be baptized really soon! Our planning has really improved, so we are working a lot more efficiently. 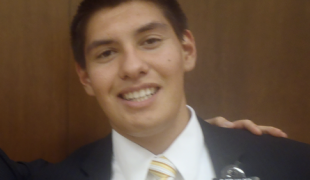 Elder Miller hurt his knee last Monday getting out of the car. I hope he can get treatment soon. He walks with a cane… We also gave some service to the Millar’s. We helped plants some flowers. It is amazing to see the ways service opens opportunities to preach the gospel! In the picture Elder Miller was cold, so they gave him a blanket. Transfers are good. I’m staying in Lunada Bay as a DL. 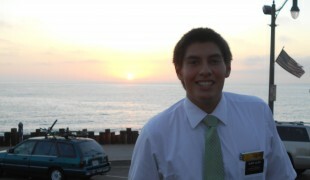 Looking forward to serving with Elder Miller! Thank you for all that you do! My sidebag was bought at Office Depot, so that might be why you had trouble finding it. I love it though! Swiss Army, so it is really sturdy. That’s so cool, you got to get an email from Sis. West. She is really nice, and is a good cook! Can I throw away my old insurance card?